Ben-Hur is a 1959 American epic historical drama film, an adptation of Lew Wallace‘s 1880 novel Ben-Hur: A Tale of the Christ, and a remake of the 1925 silent film with the same name. It was directed by William Wyler, produced by Sam Zimbalist for Metro-Goldwyn-Mayer and starring Charlton Heston, Stephen Boyd, Jack Hawkins, Hugh Griffith and Haya Harareet. The screenplay is credited to Karl Tunberg but includes contributions from Maxwell Anderson, S. N. Behrman, Gore Vidal, and Christopher Fry. Ben-Hur had the largest budget ($15.175 million) as well as the largest sets built of any film produced at the time. Costume designer Elizabeth Haffenden oversaw a staff of 100 wardrobe fabricators to make the costumes, and a workshop employing 200 artists and workmen provided the hundreds of friezes and statues needed in the film. Filming commenced on May 18, 1958 and wrapped on January 7, 1959, with shooting lasting for 12 to 14 hours a day, six days a week. Pre-production began at Cinecittà around October 1957, and post-production took six months. Under cinematographer Robert L. Surtees, MGM executives made the decision to film the picture in a widescreen format, which Wyler strongly disliked. More than 200 camels and 2,500 horses were used in the shooting of the film, with some 10,000 extras. The sea battle was filmed using miniatures in a huge tank on the back lot at the MGM Studios in Culver City, California. The film score, composed and conducted by Miklós Rózsa, is the longest ever composed for a film and was highly influential on cinema for more than 15 years. 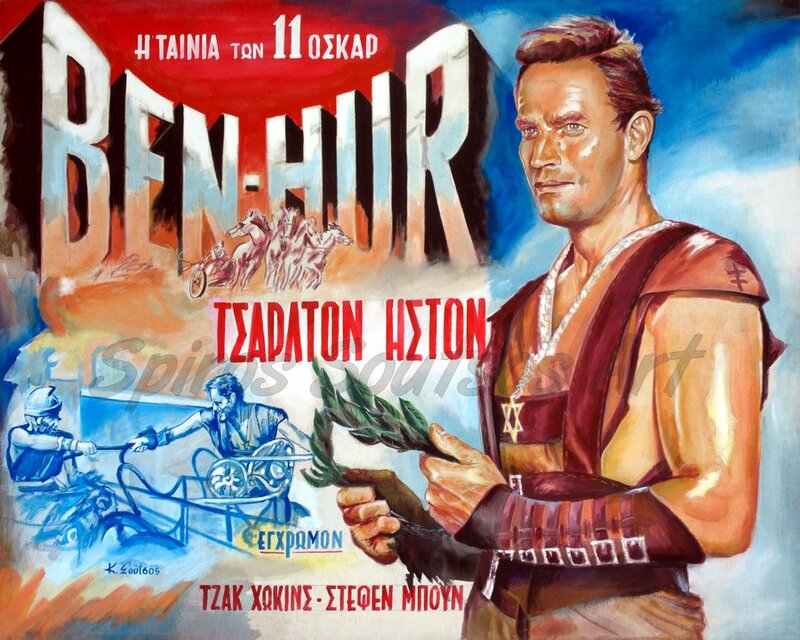 Many actors were offered the role of Judah Ben-Hur before it was accepted by Charlton Heston. Burt Lancaster stated he turned down the role because he found the script boring and belittling to Christianity. Paul Newman turned it down because he said he didn’t have the legs to wear a tunic. Marlon Brando, Rock Hudson, Geoffrey Horne, and Leslie Nielsen were also offered the role, as were a number of muscular, handsome Italian actors (many of whom did not speak English). Kirk Douglas was also interested in the role, but was turned down in favor of Heston, who was formally cast on January 22, 1958. His salary was $250,000 for 30 weeks. William Wyler originally wanted Heston for the role of Messala, but sought another actor after he moved Heston into the role of Judah Ben-Hur. Stephen Boyd was offered the role on April 13, 1958. The chariot race in Ben-Hur was directed by Andrew Marton and Yakima Canutt, filmmakers who often acted as second unit directors on other people’s films. Each man had an assistant director, who shot additional footage. Among these were the young Sergio Leone, who was senior assistant director in the second unit and responsible for retakes. William Wyler shot the “pageantry” sequence that occurs before the race, scenes of the jubilant crowd, and the victory scenes after the race concludes. The “pageantry” sequence before the race begins is a shot-by-shot remake of the same sequence from the 1925 silent film version. Wyler added the parade around the track because he knew that the chariot race would be primarily composed of close-up and medium shots. The nine-minute chariot race has become one of cinema’s most famous sequences. Following a $14.7 million marketing effort, Ben-Hur premiered at Loew’s State Theatre in New York City on November 18, 1959. It was the fastest-grossing as well as the highest grossing film of 1959, in the process becoming the second-highest grossing film in history at the time after Gone with the Wind. It won a record 11 Academy Awards, including Best Picture, Best Director (Wyler), Best Actor in a Leading Role (Heston), Best Actor in a Supporting Role (Griffith), and Best Cinematography, Color (Surtees), an accomplishment that was not equaled until Titanic in 1997 and then again by The Lord of the Rings: The Return of the King in 2003. Ben-Hur also won three Golden Globe Awards, including Best Motion Picture – Drama, Best Director and Best Supporting Actor – Motion Picture for Stephen Boyd. Today, Ben-Hur is widely considered to be one of the greatest films ever made.